With hoghair brush, paint terracotta pot with the brown Glass Glaze. When dry, use the gold glass liner to paint with a dry brush over the brown. Tip: Place pot on a “Lazy Susan” to turn freely around and to paint without touching the pot. We used the Glass Glaze because of its transparent features that enhance the texture of the terracotta pot. Fill the pot with the clay until half. Place the candleholder off center inside the pot and fill with the rest of the clay to 1,5cm from the top. Push the glass trunk right down to the bottom of the still soft clay in line with the candleholder, but not too close. As the clay dries it shrinks so make the whole a little bit bigger that the trunk by wiggling it. Remove the trunk and wash it. Leave the clay to dry. Remove the paper on the back of the self-adhesive copperfoil while pressing it on the edge of the glass disk and trunk. Using a boning tool, gently press down until smooth. Leave 1cm on the top of the trunk on both edges uncovered. Tip: At this stage the glass might be greasy and full of fingerprints. To remove and prepare the glass for the Glass Glaze, clean it with the vinegar and water solution. Place the glass disk onto the tree motif and outline the cherries with red Glass Liner and the leaves with green Glass Liner, holding the liner at a 45º angle. Leave to dry. While waiting for the outline to dry, paint the trunk, starting 1cm from the top, with the brown Glass Glaze using a flat brush, holding the brush at a 45º angle. Leave to dry. Tip: Never shake the Glass Glaze. Stir with the back of a brush to prevent air bubbles and to mix the pigment with the base before use. Should some air bubbles appear of the painted glass, remove by pricking with a dry brush. 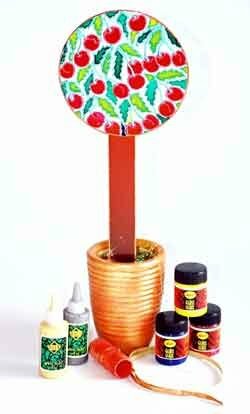 Paint the cherries and leaves by dropping Glass Glaze with a round brush into the outlined motifs. Spread the glaze in the motif from the lining to the center, making sure that the glaze bonds with the lines. Leave to dry flat for 24 hours before handling. Tip: You can achieve a more three-dimensional effect by painting half of each leave emerald and the rest green. Glue the uncovered side of the trunk to the back of the disk with the quickset clear high-strength glue as per instructions, making sure that the cherries on the disk are hanging downwards. 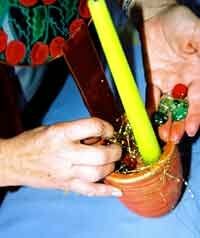 Slip the trunk into its hole in the terracotta pot and position the candle behind it in the candleholder. Sprinkle the nuggets and gold thread to cover the clay surface. On Christmas Eve light the candle to backlit the colorful cherries and leaves. This item has 665 views.